Space enthusiasts have been scouring NASA photos beamed back from the red planet looking for signs of life.And keen-eyed astronomer Joe White, 45, thinks he’s found something explosive in a picture of the Martian surface.In an image taken by the Curiosity rover, he claims to have found a sphinx potentially hundreds of feet across. Joe, a space video enthusiast from Bristol, said: “I estimate it to be at least 100 feet long, possibly 200. “When I looked at this particular NASA image I was astounded at the large head detail on this giant structure. It’s just one in a series of discoveries on Mars from people claiming to have found signs of life there. One UFO hunter claimed to have spotted something eerily resembling a gun on the Martian surface. 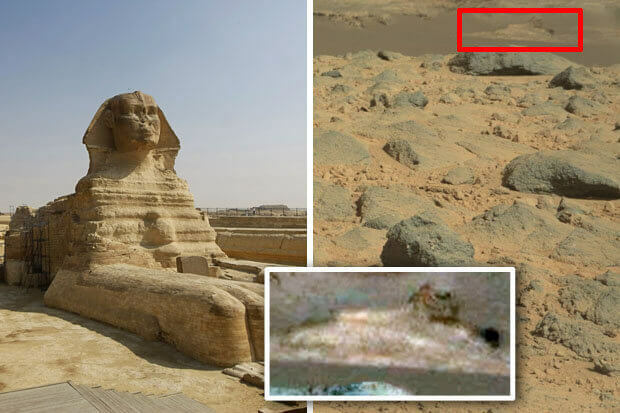 While someone already claims to have spotted a pyramid on Mars carved into a huge face. “Joe runs the YouTube channel ArtAlienTV and trawls through Nasa’s images every day to find unusual shapes.”I darkened the image to see if that would help and the detail just jumped off the screen at me,” he said, “I was quite astounded”.The image was shot from the 6ft-high right hand side mast cam on the Curiosity Rover.